This is a classic finger food, but we have punched the flavors up a bit and serve it on sensational white wine shallot biscuits. Any tasty cracker or pumpernickle bread, even cucumber slices work equally well. Combine 4 oz. smoked salmon with 1 pound of softened cream cheese, 2 or three scallions and a generous bunch of dill, tarragon, chives or a combination of all. Mix it coarsely in the Cuisinart scraping down the sides. 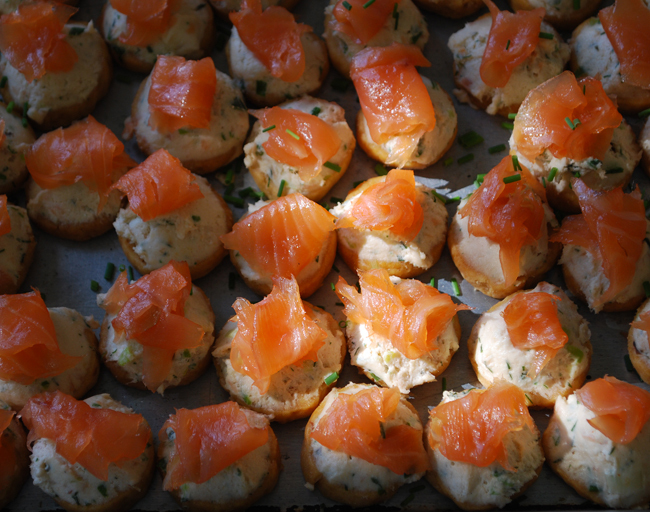 Spoon the mix onto a cracker and garnish with small slices of smoked salmon for a festive presentation. If you can purchase locally smoked salmon, it's even more delicious! Mixing some salmon in with the cream cheese rather than just garnishing the top makes a real difference and the result is a scrumptious little appetizer.